Opportunity! 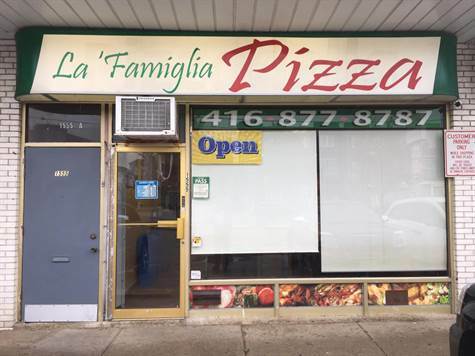 Profitable Family Run Pizzeria With Diverse Menu. Established 9 Years At This Location. Bordering On East York, Scarborough And North York. Mix Of Residential And Commercial In Immediate Neighborhood. Well Marketed On Social Media. Two-Thirds Of Sales Are Delivery And One-Third At Take-Out Counter With Seating Area. Open 6 Days Per Week. Existing Lease To April 1, 2020, Plus One 5-Year Renewal Option. Rent Only $1,850/Month Including Hst. Extras:Includes Two-Tier Pizza Oven, Gas Burner Stove, Deep Fryer, Prep Equipment, Walk-In Cooler, Stand Alone Fridges, Display Fridge For Drinks, Meat Slicer, Tables, Chairs, Display On Counter, Flat Screen Tv And More.